You can now effortlessly apply your favourite falsies and achieve a firm, long-lasting hold in seconds! 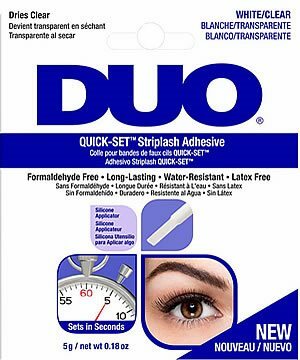 This brand new, Quick Set Strip Lash Adhesive in Clear Tone from bestselling brand DUO offers a quick and convenient lash application and an impressive water-resistant formula. This clear adhesive has been designed to offer the same durable effect as the original DUO strip lash adhesive, but has been specially formulated to set in seconds allowing you to perfectly apply your lashes in half the time. Acrylates/Ethylhexyl Acrylate Copolymer, Alcohol Denat., AMP-Acrylates Copolymer, Phenoxyethanol, Ethylhexylglycerine. STORAGE NOTE: Do NOT freeze product. Freezing will render this adhesive unusable. If you live in freezing climate, please do NOT order as the adhesive will dry up and be unusable at delivery.